PhotoFunia has been one awesome online tool for really creative output from personal photos in few simple clicks (reviewed earlier). It has moved one step ahead with addition of animated effects. Besides usual cool static effects, now you can add animated effects to your images. Homepage mark animated effects with blue video icon. It has also added face detection feature to many of its photo effects. 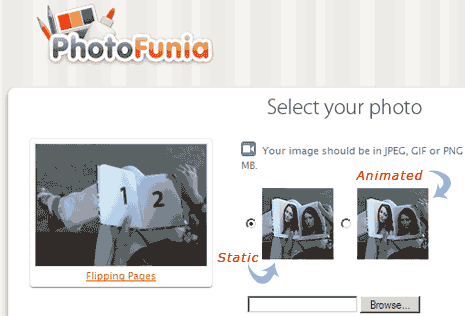 It means, even if you upload full length photo – PhotoFunia will cut the face pic from upload image and add it to the selected image effect. This results is very neat output for static and animated image creations. Now you can have more (moving) fun with photos at PhotoFunia – like it? its very fentastic and ………….good.